Have you noticed that currencies do not move much during Monday's. They usually setup to move from about 8 am on Tuesday - yes, almost like bankers hours you think? The European PPI reading clocked lower in the early morning release as did Great Britain's construction PMI. We have our Factory Orders today here in the US at 10 am. After the close today we have Austrailia's Retail Sales, Trade Balance and RBA rate statements so expect volatility in the Aussie Dollar tonight. 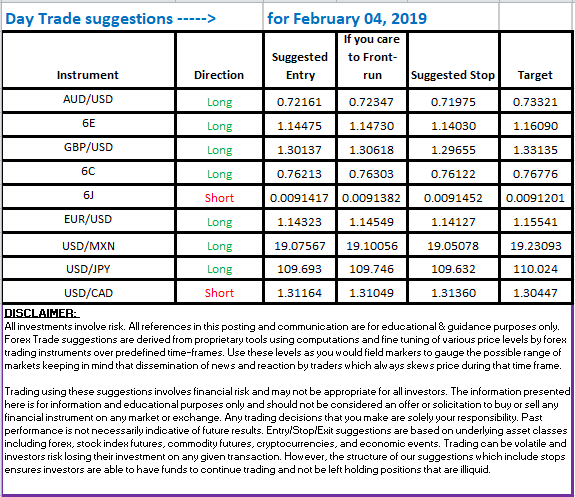 Meanwhile, here are the suggested setups for the intraday today.